HÀ NỘI — The Civil Aviation Authority of Việt Nam will take responsibility for its error over a regulation concerning legal identity papers during boarding procedures and have the error fixed. This was revealed by Đinh Việt Sơn, the agency’s deputy head on Monday. The newly released circular, which will be valid from January 15, 2018, regulates Việt Nam’s Aviation Security and Quality Control Programme. According to it, passengers bearing the Vietnamese nationality, aged 14 and above, have to present either their passport, permanent residence card, temporary residence card, identity card, certificate of the armed forces, National Assembly deputies’ card or card of the National Civil Aviation Security Commission while checking-in. 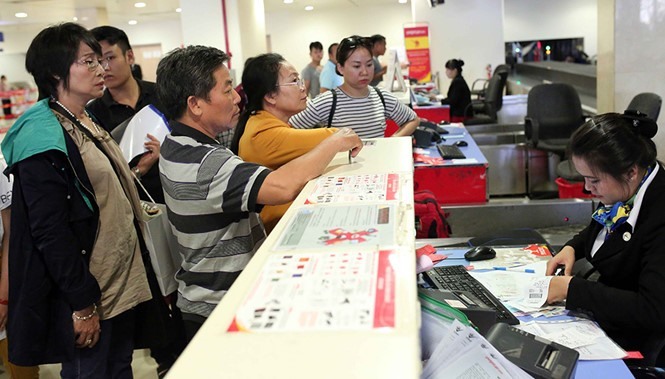 Therefore, the Party membership card, press card, driving licence, airport security control card and identification card of Vietnamese air carriers can no longer be used while checking-in on domestic flights. The circular attracted contrary opinions. Responding to Thanh Niên (Young People) newspaper, Sơn said that the press card, Party membership card and driver’s licence with identity photo can still be used for boarding procedures, and cited “typing mistakes” as the reason for this error in regulation. Nguyễn Ngọc Đông, deputy minister of transportation, confirmed that this was because of an error on the part of the Department of Transport and the Civil Aviation Authority in drafting legal papers. The ministry would further investigate and handle individuals related to this case, he said.